Find out why one of the world's most diversified utilities continues firing on all cylinders and why slowing global growth isn't likely to halt strong dividend growth in 2016. 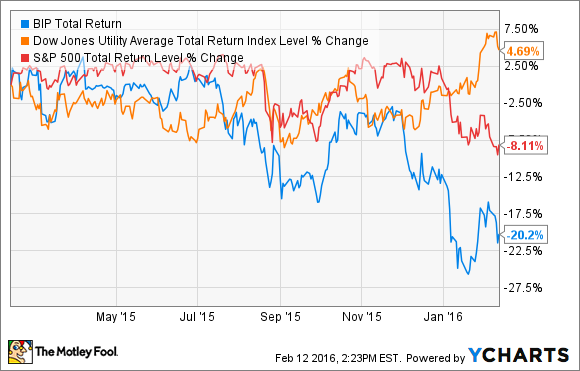 With the stock market off to a terrible start in 2016, many dividend investors are seeking safety in defensive stocks such as utilities. However, in the tradition of being greedy when others are fearful, let's look at Brookfield Infrastructure Partners (NYSE:BIP) and how it has been unfairly punished in Wall Street's mad dash for the exits. Sources: Q4 earnings presentation, Yahoo! Finance. Thanks to $808 million in organic growth investments and acquisitions, Brookfield Infrastructure Partners was able to deliver very strong growth in adjusted funds from operations, which is what funds the distribution. More importantly, 2015's AFFO yield -- AFFO divided by revenue -- matched 2014's very strong 13%, indicating that management remains extremely disciplined by investing in only those projects and deals that will help grow AFFO per unit and keep its DCR high. For income investors, the most important aspect of any dividend stock is the payout profile, which consists of the yield, long-term sustainability, and realistic growth prospects. Brookfield Infrastructure Partners' latest distribution increase of 7.5% is in line with its long-term growth plans, but even so, investors should never fully trust growth projections without evidence of a strong growth catalyst. Luckily for Brookfield Infrastructure, such a catalyst is clearly evident. For example, over the next two to three years, the LP plans to invest $1.4 billion into expanding its existing assets. This is to be funded in part by retained cash flow, which totaled $185 million in 2015. This growth plan means that management will focus on maintaining a strong and growing excess cash flow reserve. More importantly, management believes that it can achieve long-term growth in funds from operations per unit of 10%, gibing its already generous payout some added security. While Brookfield Infrastructure's excess cash flow is focused on organic investment, the true key to the LP's long-term growth is its major acquisitions courtesy of its sponsor and general partner, Brookfield Asset Management (NYSE:BAM). Brookfield Asset Management has over 100 years of experience managing global infrastructure and utility assets, and over that time its skill and expertise has allowed it to grow its assets under management to over $225 billion. With such global reach, Brookfield Asset Management is able to take advantage of global economic downturns and crises to put together extremely profitable deals for Brookfield Infrastructure Partners to acquire quality, cash flow-rich assets. For example, in recent years as the Greek debt crisis has stalled European economic growth and made investing in the continent much cheaper, Brookfield Infrastructure made large investments into European toll roads, ports, electric transmission systems, gas distribution systems, and telecommunication towers. The current commodity crash is similarly a wonderful long-term opportunity to take advantage of recessions in commodity-dependent areas such as Latin America and Australia. For example, in Q4 2015 Brookfield Infrastructure partnered with a Spanish company to cheaply invest in 1,600 km of electric transmission lines in Brazil. In Australia, the LP invested $900 million in Q4 as part of Brookfield Asset Management's massive $8.5 billion buyout of port giant Asciano. Meanwhile, Brookfield Infrastructure is taking advantage of the oil crash with its recent acquisitions of Niska Gas Partners and its joint venture with Kinder Morgan to take over Natural Gas Pipeline Company of America. To fund so many acquisitions, Brookfield Infrastructure needs massive access to capital. Fortunately, the commodity crash hasn't impinged on the LP's ability to raise funds, with around $2 billion in growth capital being raised in 2015. Thanks to its recent preferred equity, corporate bond issuances, and a $450 million increase in its corporate lending facility, Brookfield has nearly $3 billion in available buying power to go hunting for more deals in 2016. Last year proved that Brookfield Infrastructure Partners remains on track to continue delivering market-crushing total returns over the next five to 10 years. Management's focus on disciplined and high AFFO yield and cash flow-generating acquisitions, when combined with its strong access to liquidity and world-class deal-generation capacity courtesy of its sponsor, likely means that Brookfield Infrastructure is poised to grow strongly in 2016.